Podophyllum hexandrum Royle (P. hexandrum) is a perennial herb and widely used in clinic. The present study was designed to separate and identify the biochemical composition and antioxidant capacity of extracts from P. hexandrum rhizome. The ethyl acetate and ethanol extracts from P. hexandrum rhizome were analyzed by GC-MS (gas chromatography–mass spectrometry), and the antioxidant capacity of the extracts and the components was tested by using the DPPH (2, 2-diphenylpicrylhydrazyl) and FRAP (Ferric reducing/antioxidant power) assays. The rhizome extracts had greater antioxidant capacity than the petiole extracts in DPPH and FRAP assays. About 16 kinds of main reactive oxygen components were identified in the extracts. Components of PADE (Phthalic acid, diisobutyl ester), BADE (1,2-Benzenedicarboxylic acid, diisooctyl ester), Polyneuridine, PODD (Podophyllotoxin, deoxy), β-Sitosterol and POD (Podophyllotoxin) showed the antioxidant capacity in some degree. PODD, POD, and Polyneuridine showed stronger antioxidant capacity with the IC50 and FRAP values of 9.61 ± 0.81 and 2923.98 ± 21.89 μM, 9.98 ± 0.24 and 2847.27 ± 14.82 μM, and 13.37 ± 0.35 and 2404.32 ± 36.88 μM, respectively, than the positive control ASA (Ascorbic acid) with the values of 60.78 ± 1.22 and 1267.5 ± 30.24 μM (P < 0.01). PODD, POD, and Polyneuridine are very critical for the antioxidant capacity in the extract of P. hexandrum rhizome. These results provide useful biochemical basis and information for the potential use of this plant. Podophyllum hexandrum Royle (P. hexandrum), commonly named Himalayan Mayapple, is a perennial herb that grows in the Himalayan region and the southwest of China [1, 2]. Since 1940 P. hexandrum resin has been used topically for various skin lesions such as warts and condylomas . POD is a natural product mainly existing in P.hexandrum rhizome. It has been used in the treatment of genital infection to sterilize noncervical human papilloma virus . Penile warts can be safely treated with 0.5–2.0% podophyllin self applied . Goel et al. reported a significant antitumour effect at subtoxic, well-tolerated, sequential doses of aqueous extract of P. hexandrum. POD is also used as starting compound for the chemical synthesis of etoposide (VP16-213) and teniposide (VM-26), and its congeners and derivatives have pronounced biological activity as anticancer, antineoplastic and anti-HIV drugs [7–9]. Researchers have recently paid attention to the antioxidant activity of POD and its derivatives, such as GP7OH, GP7H, GP7 and VP16 . So far, there is no specific study on the biochemical composition and the antioxidant capacity of P.hexandrum rhizome extracts. In our previous study, GC-MS showed that the ethyl ether extract of P. hexandrum seed contained some bioactive components, such as Hexanedioic acid, Oleic acid, and Octadecanoic acid . In the present study, we tested the antioxidant capacity of ethyl acetate and ethanol extracts in the rhizome and petiole of P.hexandrum by the DPPH and FRAP assays, separated and identified the biochemical compositions of the rhizome extracts by GC-MS, and then evaluated antioxidant capacity of some identified compositions with the parameters of IC50 and FRAP value. P. hexandrum was collected from a forest (2,100 m) in HuiChuan, WeiYuan of Gansu Province, China, after the plant fruit ripened in September 2011. The plant was dried in shade under room temperature. The species was identified by Professor Yanling Qi (Gansu Provincial Academy of Agricultural Sciences, Lanzhou, Gansu, P.R.China). A voucher specimen (No.0209069) was deposited in the herbarium of College of Agronomy, Gansu Agricultural University, Lanzhou, Gansu, P.R. China. DPPH, 2, 4, 6-tris (2-pyridyl)-s-triazine (TPTZ), PADE, BADE, Polyneuridine, PODD, β-Sitosterol, and POD were purchased from Sigma Chemical Company (St. Louis, MO, USA). Ethyl acetate, ethanol, methanol, ASA, FeCl3 · 6H2O, and HCl were purchased from Guangfu Chemical Research Institute (Tianjin, P.R.China). UV-1810 (Beijing Persee General Instrument Co., Ltd, P.R.China) and Trace DSQ GC-MS (American Finnigan Company, USA) were used. Rhizome and petiole were washed, dried and grinded to powder. Then the powder was weighted (20.00 g) and soaked in ethyl acetate and ethanol (500 mg/mL) for 10 months at room temperature in dark, and was then filtered, evaporated and condensed to dryness under nitrogen to obtain extracts. Although there are numerous methods for determining the antioxidant capacity of soluble natural extracts and insoluble food components , no perfect system is available to help us know the “true” antioxidant capacity of a complex medium [13, 14]. The DPPH and FRAP assays, despite their disadvantages, are still used by many researchers for rapid evaluation of antioxidant . The free radical scavenging activity (FRSA) of DPPH was measured according to Ramadan et al. and Nencini et al. . which is one of the few stable and commercially available organic nitrogen radical assays [18, 19]. Foti et al. suggested it is an electron transfer reaction. The initial electron transfer occurs very quickly, while the subsequent hydrogen transfer occurs more slowly and depends on the hydrogen-bond accepting solvent [18, 19]. This reaction has been measured by the decoloration assay where DPPH has an absorption band at 515 nm which disappears upon reduction by an antiradical compound [18, 21]. The specific steps are as follows. where A 0 and A were the absorbance of DPPH without and with sample, respectively. The FRAP test was first introduced by Benzie et al. for measuring the total antioxidant activity, which was initially developed to assay plasma antioxidant capacity but can also be used on other fluids. In the FRAP test, reductants (antioxidants) in the sample reduce ferric-tripyridyltriazine complex (Fe3+- TPTZ), in stoichiometric excess, to a blue ferrous form (Fe2+), with an increase in absorbance at 593 nm . The specific steps were described by Tsao et al. as follows. The working FRAP reagent was prepared ex tempore by mixing 10 volumes of 300 mmol/L acetate buffer, pH 3.6, with 10 mmol/L TPTZ in 40 mmol/L HCl, and 20 mmol/L FeCl3 · 6H2O at 10:1:1 (v/v/v). where ÄA 593nm was the absorbance of the sample minus the absorbance of the blank at the 4th minute. The samples were the rhizome extracts of ethyl acetate and ethanol (500 mg/mL). Trace DSQ GC-MS from American Finnigan Company was used. The GC conditions were: 1 N NOWAX quartz capillary column: 30 m × 0.32 cm × 0.25 mm; column temperature: 50–190°C; procedure temperature: 5°C/min; carrier gas: He; vaporizer temperature: 280°C; the MS conditions were: Ion source: EI; temperature: 200°C; ionizing voltage: 70 eV; electric current of collection: 300 μA; electric current of emission: 1 mA; resolution: 600; mass: 10–600. Reagents PADE, BADE, Polyneuridine, PODD, β-Sitosterol, POD, and including the positive control ASA were dissolved in 15% aqueous ethanol and tested at the same concentration of 500 μM. Antioxidant capacity was expressed IC50 (μM) and FRAP (μM) and the test methods were mentioned above (as the DPPH and FRAP assays). The results were presented as mean ± SD of triplicate determinations. Statistical analysis was performed by SPSS 11.5. One-way analysis of variance (ANOVA) was utilized to evaluate differences. FRSAs from the rhizome and petiole extracts of P. hexandrum expressed as I % are showed in Figure 1, and the antioxidant capacity expressed as FRAP value is reported in Figure 2. FRSAs of ethyl acetate and ethanol extracts were higher from the rhizome (90.17 ± 1.11 and 94.52 ± 0.17%, respectively) than from the petiole (68.75 ± 0.52 and 77.23 ± 1.01%, respectively). The FRAP values showed the same trend as FRSAs, and the FRAP values of ethyl acetate and ethanol extracts from the rhizome were 1784.09 ± 52.07 and 2079.55 ± 34.09 μM, and the values of the petiole were 420.45 ± 85.79 and 886.36 ± 68.18 μM. In both DPPH and FRAP assays, 500 μM ASA was tested as a positive control, and the values of I% and FRAP value were 88.25 ± 0.24% and 1267.5 ± 30.24 μM, respectively. The statistical analyses showed that the rhizome extracts had greater antioxidant capacity than the petiole extracts and the ethanol extracts had greater antioxidant capacity than the ethyl acetate extract both in DPPH and FRAP assays (p < 0.01). I % of extracts from P. hexandrum measured by the DPPH assay. ASA was tested as a positive control. The data are the mean of triplicate measurements. Different letters on top of the column were considered significant at p < 0.01. FRAP value of extracts from P. hexandrum measured by the FRAP assay. ASA was tested as a positive control. The data are the mean of triplicate measurements. Different letters on top of the column were considered significant at p < 0.01. In order to further study the biochemical compositions in P. hexandrum rhizome, the extracts of the ethyl acetate and ethanol were separated and identified by GC-MS. In total, About 16 kinds of reactive oxygen were identified. The compound retain time (RT), name, molecular formula, molecular weight, area and percentage of area (POA) were listed in Table 1 (the ethyl acetate extract) and Table 2 (the ethanol extract), and the compound structures were presented in Figure 3 (the ethyl acetate extract) and Figure 4 (the ethyl acetate extract). Compound structures of ethyl acetate extracts from P. hexandrum rhizome, determined by GC-MS. 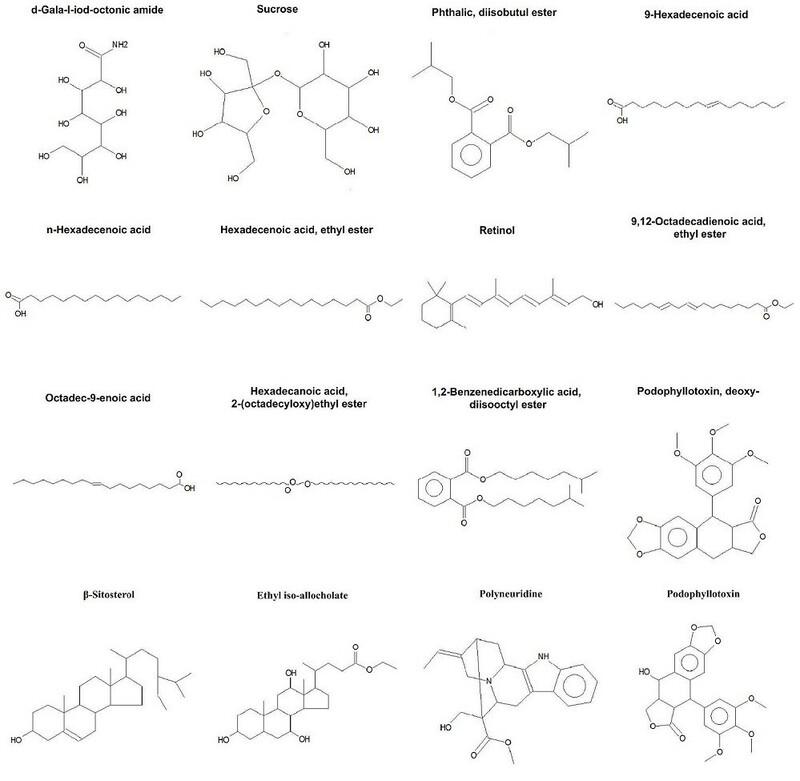 Compound structures of ethanol extracts from P. hexandrum rhizome, determined by GC-MS. The ethyl acetate and ethanol extracts contained five common components: PADE, BADE, PODD, β-Sitosterol, POD, and the POA of the five components in the ethyl acetate and ethanol extracts were 2.77 and 1.23, 2.25 and 7.05, 20.59 and 20.97, 1.61 and 1.22, 67.41 and 22.73%, respectively. The Polyneuridine also showed the high POA with 28.01% in the ethanol extract. Figure 5 and 6 show antioxidant capacity of the six components identified from the extracts by using the DPPH and FRAP assays at the same concentration of 500 μM. The IC50 and FRAP values of PADE, BADE, Polyneuridine, PODD, β-Sitosterol, and POD were 22.49 ± 0.60 and 1062.5 ± 23.39 μM, 16.32 ± 0.67 and 1025.00 ± 9.24 μM, 13.37 ± 0.35 and 2404.32 ± 36.88 μM, 9.61 ± 0.81 and 2923.98 ± 21.89 μM, 32.43 ± 0.81 and 891.37 ± 22.14 μM, 9.98 ± 0.24 and 2847.27 ± 14.82 μM, respectively. Both of the tested statistics of IC50 and FRAP values showed that PODD, POD and Polyneuridine had greater antioxidant capacity than the positive control ASA (60.78 ± 1.22 and 1267.5 ± 30.24 μM) (p < 0.01). IC 50 of the 6 components in the extracts from P. hexandrum rhizome. ASA was tested as a positive control. The data are the mean of triplicate measurements. Different letters on top of the column were considered significant at p < 0.01. FRAP value of the 6 components in the extracts from P. hexandrum rhizome. ASA was tested as a positive control. The data are the mean of triplicate measurements. Different letters on top of the column were considered significant at p < 0.01. Podophyllum contained 4–20% of podophyllum resin, which is the source of POD [24, 25]. Giri et al. reported that Podophyllotoxin is commonly extracted from P.hexandrum that contains 6–12% of resin, of which the concentration of podophyllotoxin is around 40%. Chawla et al. 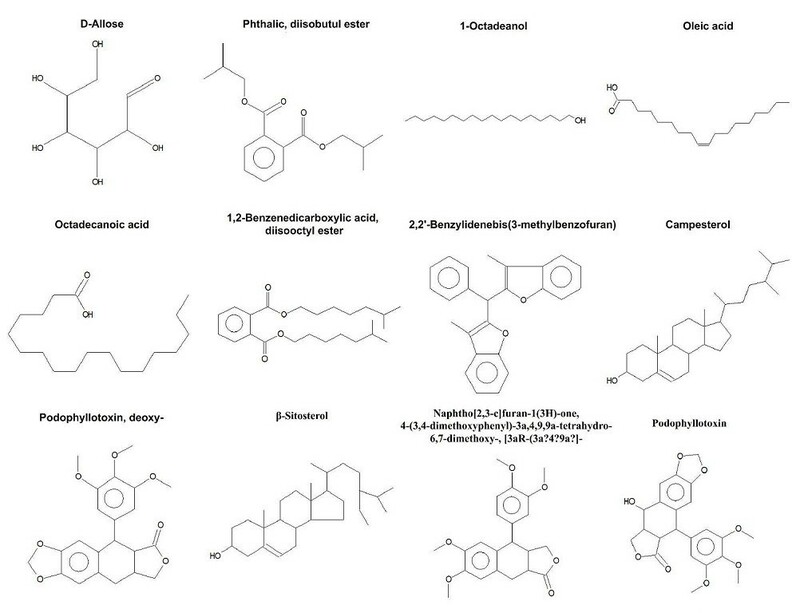 reported that polyphenols and lignans were rich in P.hexandrum rhizome, which revealed several bioactivities of direct relevance to radioprotection. In this work, about 16 kinds of reactive oxygen components were identified by GC-MS, some of which have been preliminarily studied for antioxidant capacity or identified from other plants. Zhang et al. and Jin et al. reported that POD derivatives had strong antioxidative activities. Ng et al. revealed that PODD could inhibit lipid peroxidation in brain and kidney homogenates, and the compound had antioxidant effects. Besides antioxidant potential, β-Sitosterol exhibited a protective action against DMH-induced depletion of antioxidants, such as catalase, superoxide dismutase, and glutathione peroxidase . Zhao et al. identified PADE from traditional Chinese medicines of pungent flavor and cool nature by GC-MS. Lin et al. isolated BADE from the volatile components of Eclipta prostrate by GC-MS. The six components PADE, BADE, Polyneuridine, PODD, β-Sitosterol, and POD presented high POA (pereentage of area) in the extracts, and the highest POAs of PODD, POD and Polyneuridine were 20.97, 67.41 and 28.01% in the rhizome, respectively, these results suggest that the components PODD, POD and Polyneuridine are very critical for the antioxidant capacity. Although the POAs of other components in the ethyl acetate and ethanol extracts are relatively small, antioxidant capacity was also reported in other plant extracts, such as D-allose , Dibutyl phthalate [34, 35], n-Hexadecanoic acid [33–36], Oleicacid [36, 37], Octadecanoic acid , Octadec-9-enoic acid , Campesterol [38, 39], Retinol . So far, both PADE and BADE have not been reported on the antioxidant capacity. Other active components might be present in the extracts and should be under further investigation. The rhizome extracts had greater antioxidant capacity than the petiole extracts in DPPH and FRAP assays. About 16 kinds of reactive oxygen components were identified by GC-MS in the extracts of P.hexandrum, this was the first to report PADE and BADE from a plant product and further study the antioxidant capacity of the identified components PADE, BADE, Polyneuridine, PODD, β-Sitosterol, and POD. The results of tested data and statistical analysis proved that the extracts from P. hexandrum had strong antioxidant capacity, and the PODD, POD and Polyneuridine played an important role. Based on the above data it can be recommended as an alternative plant material of antioxidant and radical scavenging activity. We are grateful for the financial support of Doctoral Fund of Ministry of Education of the People’s Republic of China (No.20096202110006), and the SRTP of Gansu Agricultural University (No.20120810 and No.20120818). We thank Yongzhong Huang, College of Chemistry and Chemical Engineering, Lanzhou University, P.R.China, for the GC-MS analysis. We also thank Jinghua Li and Jing Zhang, College of Life Science and Technology, Gansu Agricultural University, P.R.China, for collecting the plant materials. MFL designated the study, performed the statistical analysis and drafted the manuscript. LLZ and TTL participated in the extraction and the antioxidant assays. DLY did the isolation and structure elucidation part and helped in manuscript editing. WL has made substantial contribution to conception and design, and revising the manuscript for intellectual content. All authors read and approved the final manuscript.